Can't get enough of the books? Want even more of a discount? Want to make a difference in the world one book at a time? I invite you to explore the benefits of becoming a consultant: earn extra money, spread literacy, get books with a lifetime discount, meet new people, receive rewards & recognition, grow personally, and be your own boss and make your own schedule. With a low initial investment and no minimum orders required, you won't find a more family-friendly home-based business! New Consultant Kits include display titles and business supplies carefully selected to ensure success. The titles are yours to keep - so there is absolutely no risk in giving Usborne Books & More a test-drive! The commission you will earn for your first 2-3 parties will exceed your investment! 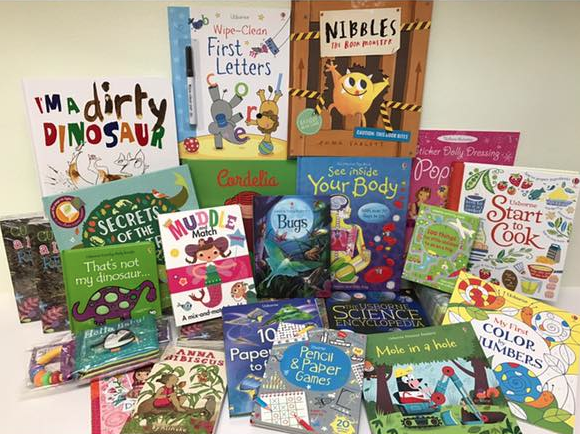 New Consultants joining Usborne Books & More can choose the New Consultant Kit for $125 or the New Consultant Mini Kit for $75. Both Kits include a set of Business Supplies. The New Consultant Mini Kit includes two featured titles plus an additional eight titles from various popular series. The Mini Kit includes 10 total titles (over $100.00 value), business supplies and a 6 month e-business package. The New Consultant Full Kit includes three featured titles plus an additional seventeen titles from various popular series. The Full Kit includes 20 total titles (over $200.00 value), business supplies and a 6 month e-business package.